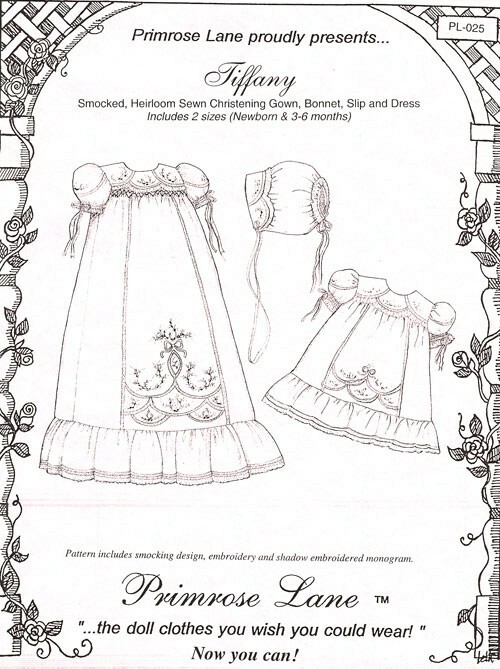 Smocked heirloom sewn Christening gown, bonnet, slip & baby dress pattern. Pattern includes smocking design, embroidery & shadow embroidered monogram. An overlay of delicate embroidered tulip scallops embellish the yoke, tulip scallop is repeated on the sleeve & bonnet. Lovely center embroidery on front panel, flouncy ruffle. Baby dress is a shortened version.